The Blue Mountains are beautiful and a magnificent natural site in Australia. They are part of the great dividing line which separates the east of the continent and stretches south of Melbourne north to Cairns. This is an attractive tourist destination for lovers of mountain experiences. A great advantage to the area is that it is quite near the capital Sydney. The name, Blue Mountains comes from the bluish haze that is regularly spread over the forest lands of the mountain and the sky. Though not as high, the mountains near the Australian capital have long been inaccessible and unruly. In 1813 climbers Lawson, Wentworth and Blaxland did not leave the valleys and ridges. Their expedition was successful, only because they finally managed to find a route through the hills. After this expedition the western valleys were beginning to settle. Before Europeans settled on these hilly areas, they were inhabitated many centuries ago Evidence of this is hidden in the many places there in the so-called red rock mountains and around town where there are preserved wall paintings of many adults and children. The region had been detected along with Aboriginal sanctuaries dating back from 22 centuries ago. The area around the Blue Mountains is included in the seven national parks and natural areas. The mountain itself became part of the world and natural heritage of UNESCO in 2000. This panorama is heavily cut by ravines, which dig distances between the hills to 760 m in depth and thriving there are more than 120 endangered plants. As natural resources in the Blue Mountains are more valuable, the park is very strictly guarded. One of the biggest attractions in the park is the unique peak named, Three Sisters. For several years, climbing ropes lowered by the most prominent peak in the Blue Mountains was prohibited. This mountain area is a favorite destination for a holiday weekend. 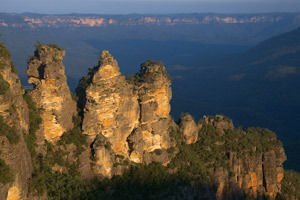 In the area of the Blue Mountains there are several towns that offer all the comforts of a quiet mountain resort. Most tourists visit the mountain because of the excellent opportunities for hiking and climbing.